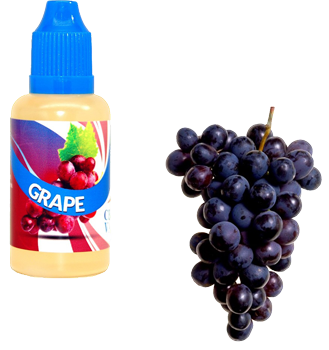 Grape E-liquid is a vape juice flavor just blasting with GRAPE goodness, followed by a nice tart finish on the exhale grape ejuice is tasty, smooth and has great vapor production in the standard 50PG/50VG blend. So go ahead and Indulge your taste buds in the ultimate grape sensation, blending the taste of fresh plump purple grapes into some amazing vapes! Grape eJuice is the full spectrum of a fruity vape you might imaging, subtle yet bold, with fruit notes packed in every bottle. Central Vapors full like of e-juices, including this delightful Grape flavor, is freshly prepared when you order and pre-steeped during delivery so your delicious flavor is ready to vape as soon as it arrives. All EJuice orders are shipped out at within 24 hours and usually even on the same day depending on the time of order placement. Awesome taste, service and price! I'm not much of a grape lover but this one had me! Love it! Great flavor but will add flavor on next order just to see. Great service and very timely. Will definitely order again. Has to be the worst ever. There is not even a hint of grape. Do not recommend this at all. Regret that I bought 3 bottles. Wasted $$$. This is supposed to be Grape? This is the second time I have tried a grape flavored ejuice and I had high hopes for this but like all the others this tastes more like the smell of flowers than anything fruity. I don't recommend and feel like I wasted my money on this one. It's good I'm getting hooked on all the flavors grape is the bomb!!!!!!! A very nice jolly rancher grape taste the day I got it. Will definitely buy a larger quantity and add it to my all day vape collection!